For a fifteen-year-old girl fortunate enough to celebrate one, her Quinceañera celebration is nothing short of magical. For Alex, her family decided to fly to Hawaiʻi for her Quinceañera portraits. Eunice decided to surprise her in-laws with a great Christmas present on their first vacation to Hawaiʻi. Sunrise in Waikīkī was an obvious choice, and we were able to split our time between the beach and Kapiʻolani Park. Gosh, this family was so much fun! Abbie, Etta, and Kaia were all so much fun. And why wouldn’t a family from Ontario, Canada have fun in the warm sun and sandy beaches? 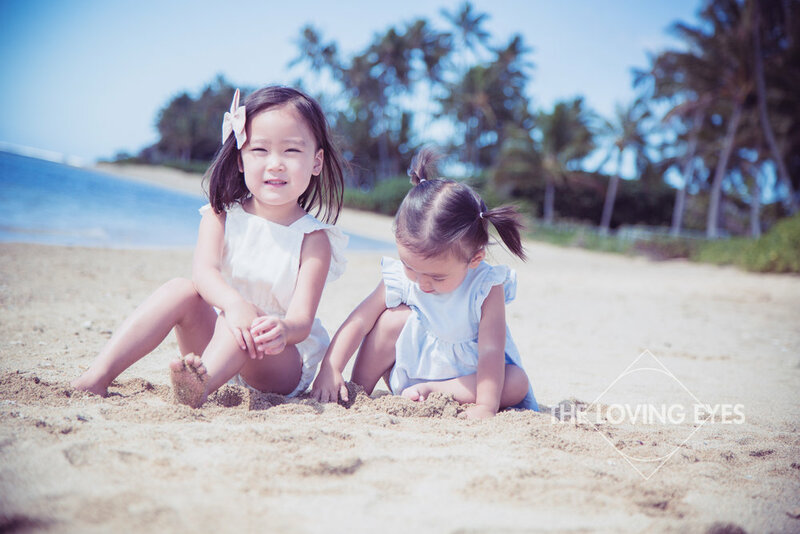 Ruby and her husband reached out to me to capture their family vacation photos during their time in Honolulu. This was their sonʻs first trip to Hawaiʻi and a very memorable one. Barbara had reached out to me for family photos during her upcoming trip to Waikīkī. This would be the first trip to Hawaiʻi for her daughter and a photo of her family would be a perfect way to remember this special vacation. I first met Tiffany at her grandfather’s 90th birthday party. A few weeks later she reached out to me with the news that she was getting married in 2019. So we planned to have their engagement photos taken at Waimanalo Beach, a great spot for long white sandy beaches and flowery fields in a lush forest. One year ago, I had the opportunity to take maternity photos with Emily and Don during their vacation here in Hawaiʻi. This year, they planned their trip again but this time with baby Michael along for the ride. The Lucas family recently relocated to Hawaiʻi for work and have quickly acclimated to the local lifestyle here. And during the recent holiday season, family photos on the beach were a great way to show off their new home to family and friends across the sea. Renna and Sean are two very fun individuals and everything about their destination wedding was relaxed and enjoyable. The Bennett Family had an amazing opportunity for a family vacation in Hawaiʻi as a part of their son’s wish with The Make-A-Wish Foundation. 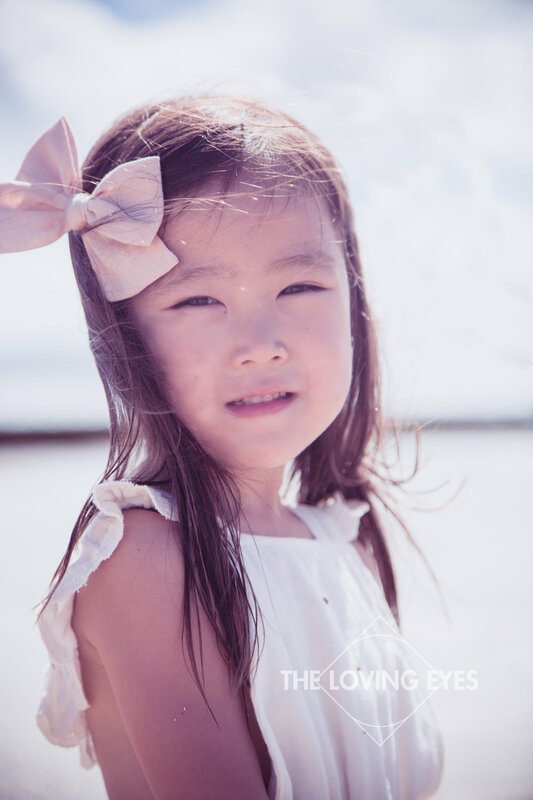 Their trip included activities and adventures that took them around the island, however one of their more important moments came during our family portrait session. Chris had planned a romantic vacation for his girlfriend, and promised that it would be a trip to remember. And with the proposal he was planning, it definitely was. 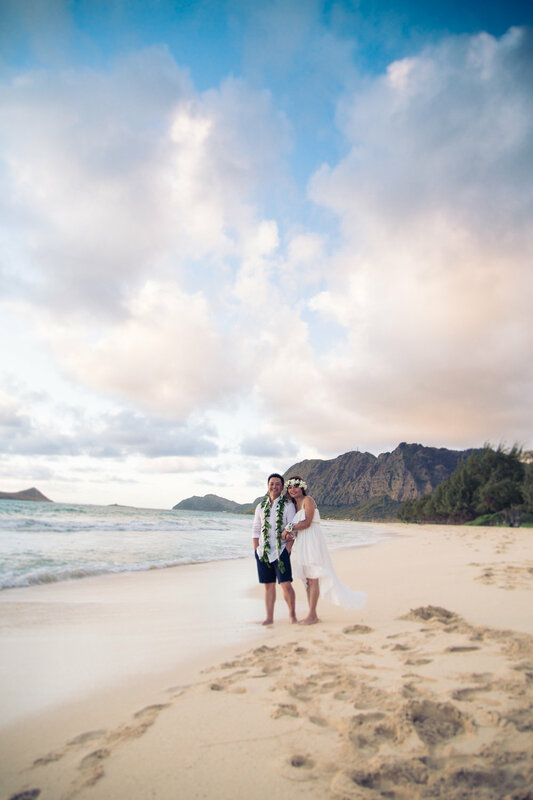 We had picked out Papaʻiloa Beach on the North Shore as the location for his proposal because it is a very beautiful beach. It is a fairly secluded beach and a perfect spot for the sunset with the Koʻolau Mountains and Waiʻanae Mountains as backdrops. How cute is this family? These two little girls were adorable and had so much fun at the beach. Maybe a little too much fun. Little ones can be tricky to photograph, as any parent can attest to. My secret - just have fun. When everyone is laughing and having a good time, we can throw out the “cheese” because we all have our natural beautiful smiles on. And if you dress up your daughters in cute clothes like this, then our photos will turn out even better! I love the work that I get to do. Being a part of so many beautiful families and capturing the moments they share with their children is such a blessing. Especially when they are friends. 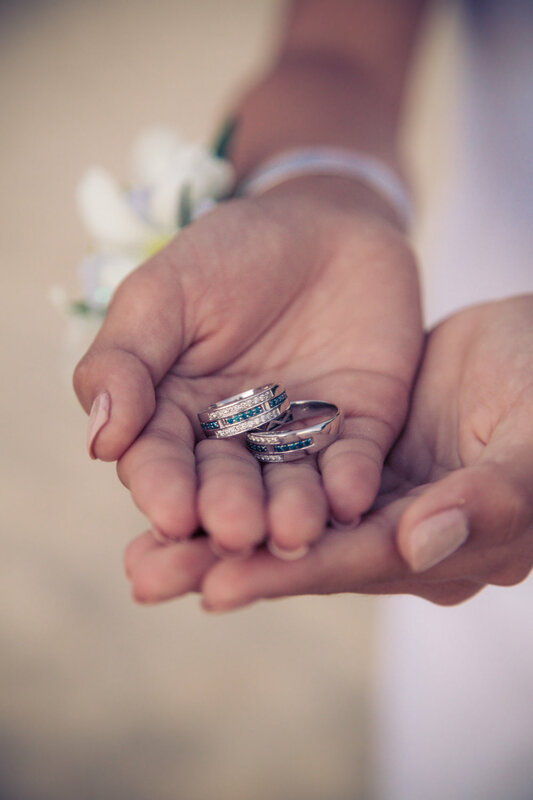 The iconic Rainbow Tower at the Hilton Hawaiian Village was the perfect place to have their wedding vows and a great way to celebrate their love for each other. At first they were a bit worried about the prospect of having family photos taken, mainly due to the challenges they have faced in the past with their autistic son. All she asked was for "one good family picture". True love is such a beautiful thing to photograph. I find that portrait sessions like these are a breeze because I am merely capturing the couple as they enjoy spending time with each other. 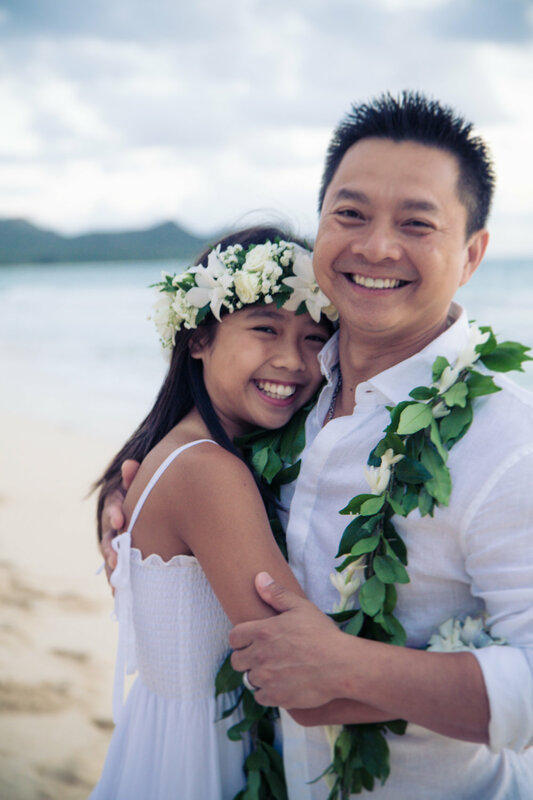 Chris lived in Hawaiʻi many years ago, and as he returned with his family for their summer vacation it was only fitting for him to renew their wedding vows at a place he once called home. The beach along Waimānalo Bay always was a special place, especially when the sun rises and illuminates the mountains from Makapuʻu to Kailua. 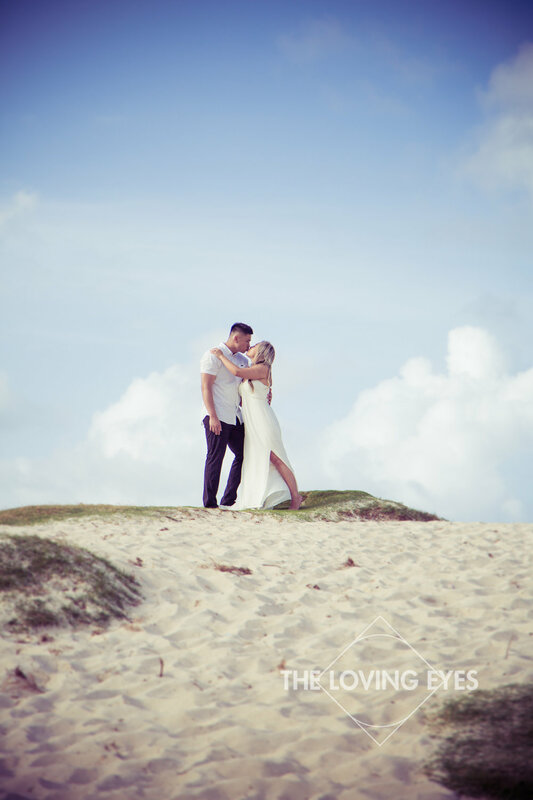 Everything about this beach is beautiful and served for the perfect location for their romantic wedding vow renewals. The Dorman boys were just that. Fun, full of energy, and would rather have spent their morning swimming in the ocean and digging in the sand. So guess where we took our photos. Smack dab in the middle of the tide pool! Neyva came to visit her fiance while he was stationed in Honolulu and thought it would be a perfect opportunity to have their engagement photos taken. She fell in love with Kailua Beach and really wanted to have her photos taken at that location - which posed a slight problem. Kailua Beach is very popular and half-naked sunbathers don't make the most attractive background objects. In the end, we were able to find some great spots for their romantic beach photos and we were all thrilled with the way that their photos turned out. When Sai booked their tickets to Hawaiʻi, his girlfriend thought that they were only going on a romantic vacation. Little did she know that he had plans to propose.